I am always very excited to make aloo-parwal gravy, during the season. This authentic dish is prepared in the northeast part of India. It is famous gravy dish of UP and Biahar. It is traditionally cooked with mustard oil and spices, the aroma of mustard oil complements the other flavours of this gravy really good . 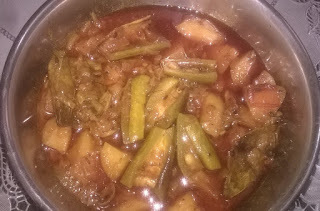 This mouth watering aloo-parwal gravycan be eaten with Roti, Paratha and rice. Preparation Time-10 min.Cooking Time- 20-25 min.Serve- 4 personIngredients8 -10 parwal (patal) 1-2 medium sized diced potatoes ½ cup chopped onion 1 medium size chopped tomato 1 tespn cumin seeds 1-2 bay leaf 1 tbspn coriander powder ½ tsp cummin powder ½ tsp chilli powder or to taste ½ tespn turmeric powder 1 tespn garlic ginger paste 1 tespn garam masala 3 tbsp mustard oil Or any oil salt to taste. 1.Wash the parwal (patal) and scrape them lightly with knife , cut the ends and cut them half horizontally. (Dont peel the skin of parwal (patal) completely otherwise it will become mushy).